OH MY GOSH! THE ICE CREAM/FROZEN TREAT BAR WAS JUST RAISED! WITH ALL THE VARIETIES OF FROZEN FARE RIGHT NOW, IT’S HARD TO FIND SOMETHING THAT SATISFIES WITHOUT SABOTAGING OUR DIETS AND NUTRITION. UNTIL NOW~ REVERI HAS FOUND A WAY TO BRING THE FLAVOR, AND FUN…WITH NONE OF THE FAT. ALL PLANT-BASED, AND NO ADDED SUGAR, THIS CREAMY DREAMY TREAT WILL BECOME YOUR FAVE! Our vision started with one simple question: what if a dessert could love you back? It’s easy to love dessert. Most of us do⎯especially the rich, indulgent kind. But we always wondered… what if a dessert could love you back? Isn’t love supposed to be a two-way street? There had to be a way to create a dessert that made you feel good while you were eating it, and continue to feel good long after you had washed the dishes and put them away. This was a challenge we were up for. Our goal? 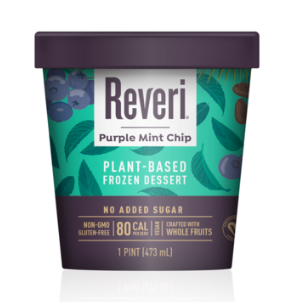 Invent a delicious frozen treat that offered up the sweet taste and creamy texture of ice cream while ditching added sugars, sweeteners, fat, animal products, and excessive calories. Turns out it’s a myth you need them. 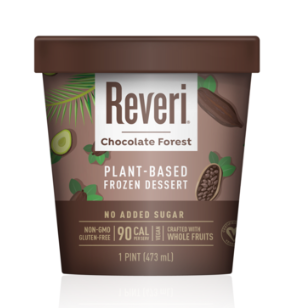 And so, the magic of Reveri was born, to become the world’s first plant based “ice cream” and redefine what “ice cream” means today! We started with the natural sweetness of whole fruits, added some vegetables (yes, vegetables!) and churned them in a way like never before. What came out of our kitchen was a versatile plant-based wonder that tastes amazing, feels satisfying afterwards, and can be eaten for any occasion. And moms and dads, here’s the best part. Kids love Reveri. 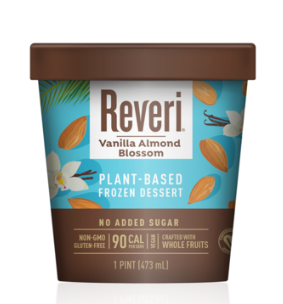 Go ahead and indulge their screams for ice cream any time of day with a bowl of Reveri, knowing you are providing them with whole fruits and vegetables, without any prodding, and without any kind of added sugar. We’re proud that by both eliminating animal products and partnering with the good people at CO2 Logic to offset our carbon footprint, we’re doing our part to build a world where everyday food products become more sustainable. WHY DO INGREDIENTS MAKE THE DIFFERENCE? Our passion is to reinvent food favorites in more healthful and innovative ways. We are driven by a curiosity to create foods that taste great while being eaten, and make the body feel great long after they are digested. We are diligent and selective when we choose and source our ingredients. We use only real whole foods and ingredients that come from nature. Reveri redefines indulgence: dig in-feel good-dig in some more!